The TRM 811 is one of two commercial-grade treadmills in Precor's Experience Series, advanced machines built for gym settings but available for home use for those with the budget to afford it. Along with the up-level TRM 835, these two powerhouses are top-of-the line treadmills that can accommodate all fitness levels. 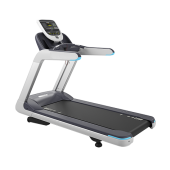 The Precor TRM 811 treadmill is light gray and black with blue accents on the base and handrails. You get a large LED P10 console showing 12 different workout metrics including calories, time, distance, incline and heart rate. Wt / Dimensions: 420 lbs / 83" x 35" x 62"
UPDATE: As of Summer 2017, it looks like the TRM 811 is no longer available. Precor treadmills have always been popular with experts and users alike, and the reviews reflect this. The company pretty much invented the treadmill, and is one of the most respected names in the industry. 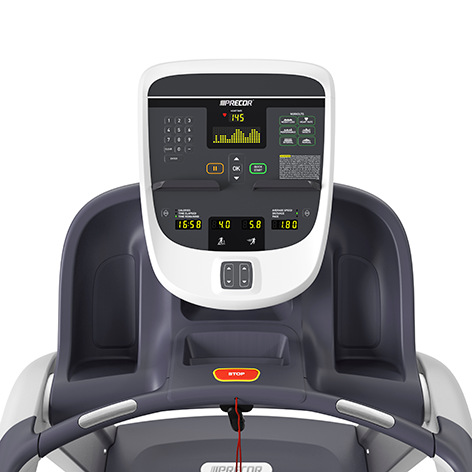 As we mentioned, the TRM 811 is part of the company's Experience Series, commercial-grade machines that are exactly like the ones you find in high-end health clubs, but available for residential use. All of the advanced technology you find in their gym cardio machines is packed into these treadmills: Ground Effects Impact Control, which absorbs the shock and significantly minimizes impact; Integrated Footplant Technology which provides a more natural stride, a high efficiency 4HP motor, a pre-waxed, reversible high grade deck and a bright LED display with all of the relevant workout stats. So it's like you are working out on a gym treadmill, even though you're at home. It feels rock-solid, and your motion, whether you are just walking or running at top speed, feels smooth, natural and impact-free. There are some differences between the Precor TRM 811 and the up-level TRM 835 model that warrant mentioning in case there are additional features that you want. For starters, the 835 has a slightly more advanced P30 console, but it's not much different than the P10. What really separates the two machines are the workouts and capabilities. The TRM 811 has 7 workout programs vs. 25 on the TRM 835. The 811 offers 12 workout metrics vs. 20 on the 835. It also goes up to a maximum speed of 12 mph vs 16 mph on the upper end model. Lastly, the Precor TRM 835 offers decline capability...the 811 does not. So does all this mean that you should opt for the 835 instead? Not necessarily. Most users will be just fine with the 811. However, if you are more serious about your workouts or just want to get the most treadmill you can get, then by all means check that one out as well. About $1000-$1200 separates the two models, so carefully weight them both to see which one appeals most to you. Both Experience Series treadmills are great machines...built to last with little to no maintenance required. You'll be more than satisfied with either one. The TRM 811 is as good as it gets, and a nice step up from the Precision Series models. It has incline capability, advanced cushioning to minimize impact, nice workouts, a bright display and a generously sized deck. If you need more speed and more workouts, as well as decline capability, take a look at the up-level TRM 835 model. Either treadmill is a dream to own, so if you have the money for it we highly recommend the Experience Series from Precor.